For guests who aren't able to travel with their pet, the hotel offers the services of Canine Ambassador Carly Copley. Carly is a black Labrador who warmly greets guests upon arrival to the hotel and is available for scheduled walks and runs with guests. 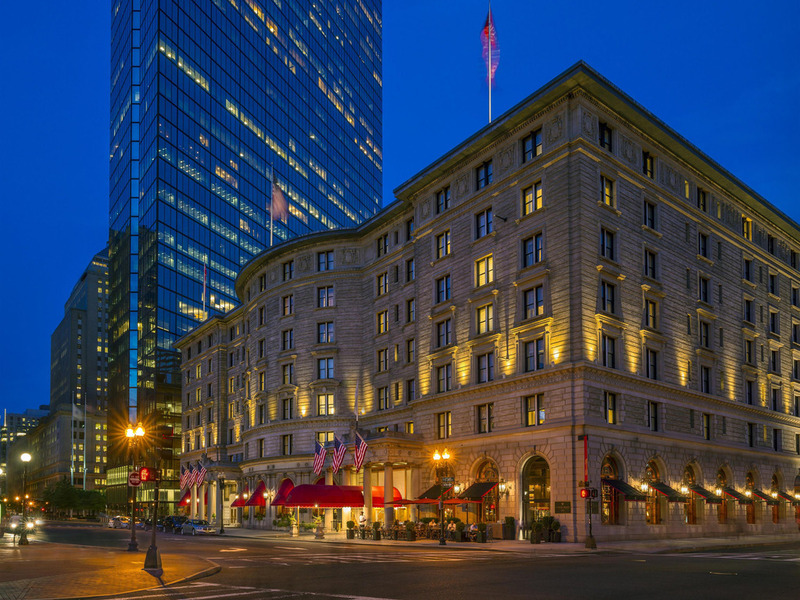 Fairmont Copley Plaza offers 383 lavish guest rooms, including 17 elegant suites. Every room has a modern look, while keeping the downtown hotel's rich history and Back Bay location in mind. Guestrooms feature business amenities as well as more common amenities like 46" LCD HDTV, telephone, hair dryer, minibar, plush bathrobes, digital safe, windows that open Keurig Coffee and more. All guestrooms and suites are non-smoking. OAK Long Bar + Kitchen is an exciting American brasserie restaurant in the heart of Boston's Back Bay. Enjoy specialty, hand crafted cocktails at the exquisite coppertop bar and a farm to table menu featuring local ingredients and purveyors. Recently voted "#1 Hotel Bar," OAK Long Bar + Kitchen offers an unforgettable food and beverage experience in one of the most iconic dining rooms in the city. It features exceptional craft cocktails, classic American wines, and a local and seasonal menu. Generally good with helpful staff but the so-called hot water needs attention. Very nice hotel with excellent interior and friendly, helpful staff. The major disappointment was luke-warm water in the evening and not really much better in the morning. Someone did come and check on my concern but there was no improvement. The bathroom was very tight, and no place to lay out a women's &quot;essential products&quot;, like creams, makeup and such. The inside shower curtain was too long as so it dragged in the bathtub as a person took a shower. I don't know if that insider liner shower curtain was changed with every new guest? Always nice to stay in the conference hotel. Nice, safe, in the heart of Boston, interior beyond magnificent. A happy one; VERY quiet, very accessible and plentiful food and drink; and again, one could just stand and stare at the gorgeous ceilings and mosaics, for example. This is a classic , QUALITY venue. Relaxing ambiance with a luxury experience. Great customer service from the start with the valet parking staff, the bellman, the receptionist and specially from the Fairmont Gold staff! Toilet in bathroom runs constantly, which is a waste of water, and which makes a constant sound. Disappointed that there was no free WiFi in the room. Business center printing rates were very expensive. Our room seemed stuffy/humid. Staff was generally very friendly and helpful. Always like coming. The breakfast was wonderful but the afternoon 5-7 did not measure up to high quality. Again, it was well enough. I had an enjoyable stay. I was amazed how the hotel staff could not keep my room cool without instructing me to open the window in my room. This is unacceptable for a luxury hotel!! We enjoyed the beauty of this historic hotel plus the service could not have been more efficient . Our check in was helpful as we arrived early. This historic hotel has been well maintained . The staff was friendly and helpful. We especially enjoyed our late night room service. The food was not only delicious but nicely presented. The hotel is lovely, with wonderful service. I really enjoyed every minute; and hope to return. The neighborhood was really nice to walk in; and the shuttle goes to and from the airport. It couldn't have been more convenient! The hotel was lovely; conference I attended was too crowded (not your fault). Very nice. The concierge was especially helpful. I do believe, however, that with the price per night, a bottle of water in the room might be complimentary ??? Cheap, Cheap, Cheap....not even a cottonball or Q-tip or bottles of H2O in the room. The experience was so disappointing and I had so looked forward to staying with you.